Feel its soul from 12 bars! This is the most simple chord progression of blues. As it’s composed of only 3 chords, it’s called “three chord blues”. We deal F key in this lesson, but it’s often played in another key. F7 nad B♭7 are not diatonic chords of F key. We should think they have changed from FM7 and B♭M7. (They have changed because cooler, feeling bluesy.) Then, F7 is tonic, B♭7 is subdominant, of course, C7 is dominant. Beginning with I7, and IV is coming in 5th bar. It’s the feature of blues. Let’s re-create the simple blues noted above! At first, the 9th and 10th bars can be converted to “two-five” onto F7 in the 11th bar. The 12th bar can be changed to “two-five” onto F7 in the repeated 1st bar. 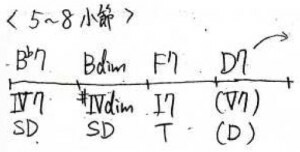 In the last half of the 11th bar, we put D7 as V7, thinking Gm7(the 12th bar) as temporary Im7. We change B♭7 in the 6th bar into Bdim. We can do it because the composing tones of B♭7 (B♭, D, F, A♭) are almost same as of Bdim (B, D, F, A♭). And along 5th to 7th bar, B♭7’s root (B♭)→Bdim’s root (B)→F7’s 5th (C), the streaming motion going up halftone is so cool! In the 8th bar, we put D7 as V7, thinking Gm7(the 9th bar) as temporary Im7. As the same F7 through 4 bars is boring, we’ve changed the 2nd bar into B♭7. It’s finished! Blues like this chord progression is usually played in jazz. There are some other patterns. Know the change from three chord blues to jazz blues. Let’s remember the chord progression of blues! All the 8 lessons of “Music Theory for Beginners” is finished.